>A dear friend recently asked to borrow some books for a trip to Mexico with her husband, who is battling cancer. I gathered a few paperbacks (easier for travel) from my shelves and took them to our regular meeting at Starbucks. That was about a month ago. So, last week when we got together, she told me all about their trip, and showed me the beautiful memories she had captured in her watercolor journal. 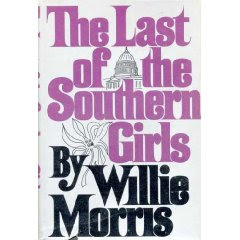 As she was returning some of the paperbacks, she commented briefly on one of them, The Last of the Southern Girls by Willie Morris. 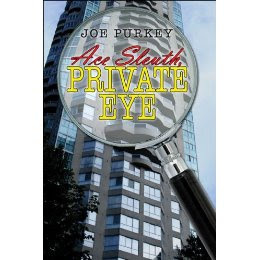 My mind struggled to recall the plot of this book that I had read several years ago. I had remembered it as a romantic tale of an Ole Miss sorority girl taking on Washington society in the sixties and seventies… the same years that this Ole Miss sorority girl was still stuck in Mississippi. I was on a spiritual and cultural journey of a completely different kind. Some of the difficult parts of that journey are being recorded in the pages of my memoir-in-progress. And yeah, there’s lots of sadness there, but it’s a memoir, not a romantic comedy. Doug, Patti and Herman (and Tom, who couldn’t join us yesterday because, well, because his loyalties were torn—he was at the Ole Miss-Florida game watching the Rebels whip up on the Gators down in the swamp) are all “sensitive southerners” who definitely share this burden of memory, and this profound awareness of the past. All four of us are working on memoirs, stories and novels involving those memories and histories, across Louisiana, Mississippi and Alabama. So, it was fitting that our group, the Yoknapatawpha Writers Group, met down on the banks of the Mississippi River Saturday, since the name “Yoknapatawpha” (the fictional county in many of Faulkner’s writings) means “water flowing slowly through fertile ground” … which is what we’re trying to capture with the slow but important work of illustrating a culture with our writing. The work is slow, but hopefully, the ground is fertile. We usually meet monthly in Oxford, but with the Presidential Debate, we knew the traffic would be wicked, so Herman proposed that we meet out behind the Ornamental Metal Museum in Memphis, with its amazing view of the river. Herman is a member of the Museum, and a contributing sculpture/artist. It was beautiful on the lawns behind the museum and workshop, where folks were setting up a tent, tables and chairs for a late afternoon wedding. I couldn’t resist taking a few pictures. This one, “The Whistling Pig,” is part of the current Art Cookers III exhibit, and is actually a working steam powered calliope, like the ones found on riverboats. I heard one for the first time back in May, when I was in New Orleans. A nd even this flower on the bluff by the river, signaling the rare and glorious days of an Indian Summer here in Memphis. We took a break for lunch at the nearby Arcade Restaurant, on South Main Street, where we sat in the “Elvis Presley” booth, the last booth in the back of the main room. Back on the grounds of the museum, we continued our work, amidst the buzz of the wedding set- up. It was also fascinating to watch the “boat stores” on the river, carrying groceries to the tug boats that pushed the barges up (or down) the river, so that they never needed to stop their journey, even to refuel or change crews. Herman enjoyed sharing some of the history of the museum with us, like this memorial gate and the artists who contributed to it. Doug captured Herman, Patti and me posing in front of it. Earlier, Herman had told me the story of this unusual metal sculpture of the top of a man’s head, which a ppears to be drowning, sinking into the fountain beneath. The sculptor was dying, with Lou Gherig’s Disease, but he designed the piece and even in his wheelchair, gave directions for its installation. After we finished our afternoon critique session, we enjoyed a cool evening on the deck outside at Bosco’s Squared in midtown. The writer’s surreptitious scars. I wonder if they will be visible to our readers, or if they are only seen by the ones on whom they have been inflicted? Oh, the burden of memory. 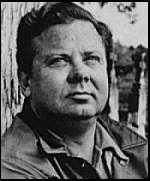 Why do Southern writers endure it? To reclaim a part of our life, as Scott Morris said at the Yoknapatawpha Writing Workshop back in June. 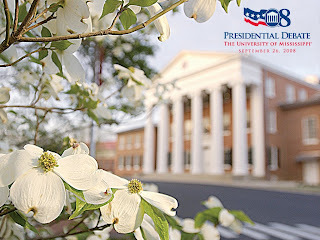 As Americans wait to see how our leaders in Congress will deal with the current financial crisis, thousands of folks working on the first official Presidential Debate, scheduled for tomorrow night at Ole Miss in Oxford, Mississippi, must be going nuts. They’ve spent over $5 million on preparations for the debate, and Mississippi Governor Haley Barber is still smiling and saying “We’re planning on having the debate,” but don’t you know it’s crazy down there? My writing group that usually meets monthly in Oxford moved our gathering to Memphis this Saturday, not wanting to deal with the traffic or the crowds that might still be hanging around the next day. With the debate “up in the air” at this point, I hope my husband’s flight home from Washington, DC tonight isn’t affected by the last-minute crazies that might be also hitting the airlines, with candidates and their attendants also flying into Memphis, either tonight or tomorrow, since our airport is closest to Oxford. Traveling mercies go out to him and to everyone else coming our way! Those who know me well know that I’m not a very political person. I’m not smart enough or committed enough to spending the time needed to figure this mess out. 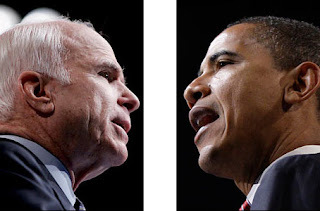 You won’t read many opinions about political issues on this blog. Oh, yes, I’ll vote, but I place my hope in a kingdom that is not of this world, so I pray for our leaders more than I campaign for them. Yeah, I’m sure some of you are thinking that’s a cop-out, but again, I’m paying attention when I can, and I will vote on November 4. Maybe Billy Joel was right. Maybe the generation that came of age in the fifties and sixties didn’t start the fire, but we certainly fanned the flames. The second one is more like the newsreels we used to watch before the main feature started at the movies. Remember that? Anyway, I hope you enjoy the videos, and I’ll be back sometime over the weekend. A couple of weeks ago, while I was in Jackson (Mississippi) visiting my mother, my car got ploughed into in the parking lot of the hotel where I was staying. When I got back to Memphis, I called our insurance agency, and they told me to call “Betty” at the company who carries our policy. They also told me that if I had reported it to the police we wouldn’t have to pay more than $200 of the cost of repairs. (We have a $1000 deductible.) So I called the Jackson Police Dept toldthem what happened, and asked if it was too late to file a report. She said yeah, that I would have had to call it in the day it happened. My ignorance would probably cost me $800. The next week I get estimates at two different body shops to see how extensive the damage is and decide to file a claim with our insurance company. Betty calls to set up the appointment for an adjustor to come look at the car. First she asks me to tell her what happened, so I relate the story of coming out of the hotel into the parking lot in Jackson and finding my car bashed in. The 24-hour security guard wasn’t around (he circles the building and can’t see the front and back at the same time) and there’s a sign by the door to the hotel that says “We are not responsible for damage done to vehicles in the parking lot.” I had an appointment with the nurse at my mother’s assisted living home, so I didn’t take time to go in and tell the clerk at the front desk about it… thinking it wouldn’t help. She sounds like she’s twelve, but as soon as I tell her the story, she says, “I don’t mean to sound condescending, Miss Susan, but you should always report anything that happens to your car, even if you like hit a deer, because then we can like open an uninsured drivers case….” Blah blah blah. She continues to tell me about setting up an appointment and that the adjustor could even give me a check on the spot, so I ask if I could take the car anywhere I want to have it repaired and she says yes. So I tell her I’ve already taken it to two shops and she asks which ones and when I tell her and she says one of them is one of their “VIP” shops. I say great, it’s right around the corner from my house, so it will be convenient. So she gets the manager at the body shop and me on the phone and I suggest11 a.m. on Monday and the manager says that’s great. 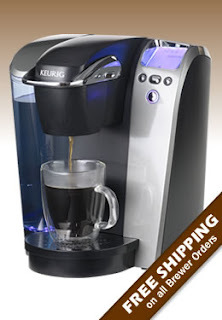 Then I say wait—what about the adjustor. Does that time work for him? At that point Betty says to the manager at the shop, “Oh, um, thanks so much, I’ll talk with you later,” and he hangs up. Then Betty says to me that sometimes the adjustor, whose nickname is “Speedy” (or something like that) can’t make it to an appointment when he says he can, due to a previous appointment, but it really isn’t necessary for him to even be there. I’m confused now. I thought the appointment was with Speedy, not the body shop. “So, how will you even know the difference, if Speedy doesn’t show up?” At this point I’m irritated and finally give Betty a piece of my mind, beginning with telling her that she did sound condescending when she gave me the little lecture earlier, and when she called me “Miss Susan,” and that she sounds like she’s twelve years old. And that she’s changed her story at least twice, beginning with saying the adjustor could come to my home and ending up with the adjustor doesn’t even have to be there. And that I’m 57 years old, and my time is as valuable as Speedy’s, so if I make an appointment to show up somewhere at 11, I’ll be there, because I’m an adult, etc. In the midst of all this she asks, “do you have lots of accidents?” in another condescending tone… and I still don’t know why she asked that, but I say, no, and that this wasn’t an accident, either, it was a HIT AND RUN in a motel parking lot when I wasn’t even in the car. She also asks if we have a lien on the car… that her records show that such-and-such-a-bank is the title holder and I say no the car is paid for, and that bank doesn’t even exist any more. In the end I just say I’ll take the car to the shop and it doesn’t matter if Speedy is there or not or what kind of deal her insurance company has with the shop, since I’ll only be paying the $1000 deductible anyway. And there went an hour of my valuable time and a severe break in my concentration as I’m writing and revising my book-in-progress… which is at least as important as Betty’s work at the insurance company. But over the weekend I go to church and we have the memorial prayers for Mary Allison and I take my five-year-old Goddaughter, Sophie, up for communion with me, and, well, it begins to bother me that I was angry with this girl at the insurance company. On Monday morning I find my way to my icon corner and say my prayers, and my heart softens. Peace begins to return. After all she’s only, what, twelve? So I call to apologize to her, believing that my anger is only hurting me, right? I’m responsible for my own behavior, not the behavior of others—especially not twelve year olds who are not my own children. I get her voice mail, but leave a humble pie message, and then take my car to the shop. About then Speedy comes inside with a check, made payable to me and the body shop, and says all I need to do is sign it over to them once the work is done, plus another $500, for my deductible. Who am I to argue with the likes of Speedy and Betty? Or an insurance company? So I smile and say thank you, and Speedy leaves. I just smile. Ready to make nice. No more anger. >It’s been almost two years since I dove into this writer’s life with serious abandon. It was October, in 2006, when I met Cassandra King, Lee Smith, and Beth Ann Fennelly at the Southern Festival of Books here in Memphis. Each of them inspired me—some by their personal interest and encouragement, others by their contributions to panels and interviews during the weekend, others by the treasures I discovered, purchased, took home and devoured, their books. Within three months I had drafted a novel. And although that first book is on a shelf, waiting for major reconstruction at some point in the future, the writing of it propelled me into this writer’s life that is at times exhilarating (like when the words come flowing from my pen with passion and speed, or when an editor emails to say she’s going to publish another one of my essays, or when a faculty member at a writer’s workshop compliments my work) and at other times discouraging (like when the words that come flowing from my pen, slowly, are boring, even to me, or when I receive yet another rejection email from a potential agent) or disparaging (like when I find myself listening to the “watchers”—the negative voices saying you can’t do that or what will people think) or, just lonely, like I felt a good bit this last week. Yes, I know I complain a lot about not having enough uninterrupted, personal, private time for writing. So this last week, I found it. And I drafted seventeen pages of the book I’m working on, which is a lot for me, for one week. But it was a dark week. I’ve been depressed a lot lately, but I tried to let the dark side fuel my work instead of suppressing it, and at the end of the day, it felt good to be moving forward. It is a silver morning like any other. I am at my desk. Then the phone rings, or someone raps at the door. I am deep in the machinery of my wits. Reluctantly I rise, I answer the phone or I open the door. And the thought which I had in hand, or almost in hand, is gone. Creative work needs solitude. It needs concentration, without interruptions. It needs the whole sky to fly in, and no eye watching until it comes to that certainty which it aspires to, but does not necessarily have at once. Privacy, then. A place apart—to pace, to chew pencils, to scribble and erase and scribble again. But just a often, if not more often, the interruption comes not from another but from the self itself, or some other self within the self, that whistles and pounds upon the door panels and tosses itself, splashing, into the pond of meditation. And what does it have to say? That you must phone the dentist, that you are out of mustard, that your uncle Stanley’s birthday is two weeks hence. You react, of course. Then you return to your work, only to find that the imps of idea have fled back into the mist. What a great reminder that it’s not just outside factors, and people, who interrupt the writer at work, it’s our own inner noises. This isn’t just true of writing, other serious pursuits require silence. Take prayer, for example. When my children still lived at home and I would complain that I couldn’t find a quiet time to pray, then suddenly they’re all gone and I’ve got nothing stopping me from standing at my icon corner, all noises off, and entering into diligent and meaningful prayer first thing in the morning. There are no school lunches to prepare, no carpools to drive, and my husband gets his own breakfast. So what do I do? I sleep an extra hour, then get up and immediately jump into a day of busy activities, and sometimes slots for writing, but often without that precious spiritual food I craved when the house was full of noises—that time of prayer. Like most humanoids, I am burdened with what the Buddhists call the “monkey mind”—the thoughts that swing from limb to limb, stopping only to scratch themselves, spit and howl. From the distant past to the unknowable future, my mind swings wildly through time, touching on dozens of ideas a minute, unharnessed and undisciplined. …the mind of an artist, in order to achieve the prodigious effort of freeing whole and entire the work that is in him, must be incandescent…. 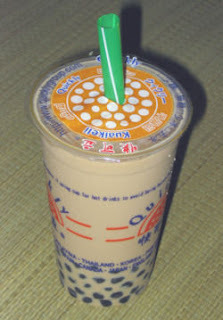 There must be no obstacle in it, no foreign matter unconsumed. Virginia Woolf wrote, “Across the broad continent of a woman’s life falls the shadow of a sword.” On one side of that sword, she said, there lies convention and tradition and order, where “all is correct.” But on the other side of that sword, if you’re crazy enough to cross it and choose a life that does not follow convention, “all is confusion. Nothing follows a regular course.” Her argument was that the crossing of the shadow of that sword may bring a far more interesting existence to a woman, but you can bet it will also be more perilous. So here I am. Monkey-mind working. The shadow of the sword to be crossed, the perilous existence to be lived. The loneliness and solitude to be embraced. The privacy and courage to be found. And then maybe, just maybe, the words will become art and the prayer will bring peace. Here’s to the next seventeen pages, and to a week lived with the mind in the heart. 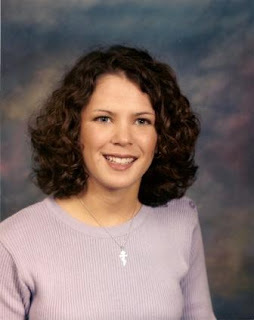 Ten years ago today, my 20-year-old Goddaughter, Mary Allison Callaway, was killed by a drunk driver. Mary Allison and her mother, Deborah and her brother, Carter, were part of the early group of seekers who became St. Peter Orthodox Church in Jackson, Mississippi, back in March of 1987. My husband and I were part of that group from 1970 until we moved to Memphis in 1988. Mary Allison often visited my parents’ store, Bill Johnson’s Phidippides Sports, where her mother took my aerobics classes in the 1980s. 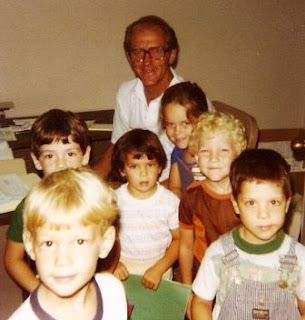 Here she is, in the center of a group of children who gathered in my dad’s office in the back of the store. Yeah, some of ya’ll might recognize those other kids, who are now all in their 30s! Clockwise from bottom, left: Jordan Henderson, Jonathan Cushman, “Papaw” (Bill Johnson), Joanna Meadows, David Algood, Ben Skirtech, and of course, Mary Allison in the center. This picture holds bittersweet memories for me, because my father died in July of 1998, just two months before Mary Allison. And their graves are only a few feet apart, up on a hill at Natchez Trace Memorial Park in Madison, Mississippi. I like to stop there on some of my trips to visit my mother and sit on the bench under the tree that overlooks the hilly cemetery. In February of 2006 we buried my brother, Mike, in a third grave near Mary Allison and Papaw. I’ve cried lots of tears sitting on that bench over the years. But back to Mary Allison… she graduated from my alma mater, Murrah High School, in 1996. Here we are at her house, just before her graduation that May. She had already begun to spiral into some dark holes, and continued to struggle with substances and behaviors that she hoped would numb the pain of some really difficult things in her life. But in December of 1997, she made the brave decision to face the pain and turn away from the things that were bringing her down. Part of that decision meant moving away from Jackson, so we offered for her to live with us in Memphis. She moved in with us in January of 1998 and began working, with plans to enter college after establishing Tennessee residency. Those early months with us were a joy for us, but difficult for Mary. I’m sure she’d say there were joys for her, too. Our two younger kids were still living at home. Jason was 16 and Beth was 15. One of my favorite memories of the three of them together was on the some evenings when it neared bedtime (for my husband and me, the teenagers stayed up later than us by then) Mary Allison would grab Jason and Beth by the hands and find my husband and say, “Can we have a blessing?” The Orthodox tradition is for the father (or either parent) to give the children a blessing before bed, making the sign of the cross over them with the blessing. At the end of the blessing Mary would pull them into a group hug. I often fought back tears watching this scene play out night after night. I think Mary Allison reminded us all of things we took for granted at that time. Or maybe of things we still struggled with ourselves. 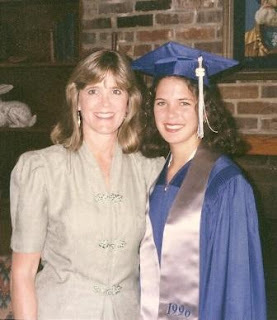 On September 18, 1998, Mary Allison was driving to Indianola, Mississippi, to visit her mother and grandmother. It was both of their birthdays. She had gone to prayers at St. John Church that morning, then on a picnic with two friends before leaving our house for the drive to Indianola. She was bubbly and happy, having found the peace she had been searching for during those eight months in Memphis. I got a phone call from her mother early that evening. “Mary Allison has gone to heaven,” was how she began, through her tears. She related what had happened. The highway patrol had called to say that Mary Allison had been hit, head-on, by a drunk driver on the way to Indianola. Evidently, a pickup truck in front of Mary saw the van coming at it and swerved off the road to avoid being hit. Mary didn’t have time to react, and took the full force of the vehicle coming at her. The coroner said she died instantly. I packed up some clothes for her burial, along with a few of her icons and other personal things from her room in our home and headed down to Jackson the next morning, to help Deborah prepare her daughter for burial. Like the myrrhbearing women, we combed her hair, applied a modest amount of makeup, and attended to a few other details that were difficult but healing for both of us. Tiny Saint Peter Church in Madison was full to overflowing, with some people watching on a video screen in the fellowship hall during the service. There was a steady stream of people, especially young people, during the all night vigil the evening before. Some brought photographs, pieces of jewelry, even hand-written notes to place in the coffin as they said goodbye to Mary Allison, and thanked her for what she had meant in their lives. 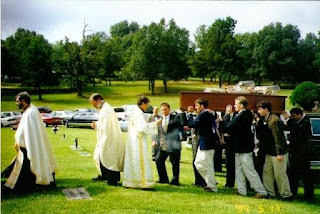 Our oldest son, Jonathan, was a pall bearer, and Father Basil participated with the other priests and deacons in the funeral and burial. This Sunday we’ll pray memorial prayers for her at St. John, and I’ll make kolliva, the boiled wheat with raisins, nuts, and honey, for everyone to share afterwards. (One recipe is here .) The wheat represents resurrected life; the nuts (or any seeds) the faith of the grain of mustard seed from the parable Jesus taught; and the honey to sweeten the suffering, because death no longer has power over us. 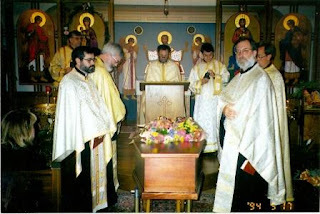 Prayers for the dead are traditional for Eastern Orthodox Christians. All who have been taken by the grave in the brightness of youth, who have been pierced on earth with the thorny crown of suffering, all who never saw earthly happiness, do Thou recompense, O Lord, through the compassion of Thine infinite love…. O Lord, receive into the mansions of Paradise youths and maidens who have departed, and vouchsafe them rejoicing at the supper of Thy Son; O Lord, soften the grief of parents over the loss of children; O Lord give rest to all who have no family, those who are alone, who have no one to pray for them, that their sins may vanish in the rays of Thine all-forgiveness. O Lord of unutterable love, remember Thy servants who have fallen asleep. I love you and miss you so much, Mary Allison. >The final day of my weekend in Knoxville arrived on Sunday… another morning of sleeping in, more of my daughter’s yummy by-the-cup (pod) coffee, a trip to Target (where we ran into Missy,the daughter of our old next-door-neighbor, Jim Meng, the architect who designed the house we lived in at one time! Missy’s a student at UT now) and delicious veggie sandwiches on 9-grain bread for lunch. Another swim in her apartment complex pool (for me, while she watched football on TV–we know what we like!) and we’re off. First stop is the University of Tennessee’s College of Architecture and Design (Beth’s a second year grad student) building which, in my opinion, wasn’t photo-worthy on the outside, but oh, my gosh, the inside was awesome. You can’t quite get the overall look of the place from the downstairs level. First I took a picture of just the lobby itself, But then, thinking about Brooks and Dunn’s song, “Put a Girl In It,” I cajoled Beth into being in the shot. Okay, maybe I wasn’t really thinking about the song at the time, but the next day (today) driving home from Memphis listening to their new CD, “Cowboy Town,” when they got to that song, I thought about putting Beth in the picture. 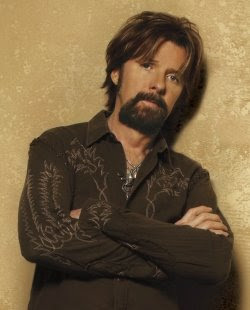 Huge leap from architecture to Ronnie Dunn, right? But he’s kinda’ nicely designed, don’t you think? But upstairs, check out the view! The professor’s offices are the wings that jut out over the atrium. The studios are along one side of the upstairs. I didn’t take any pictures inside the studio, since quite a few students were busy working on a Sunday afternoon. Or any day of the week. Pretty much 24/7. Next we headed downtown to Market Square, which has a few cute shops, (I liked one called “Earth to Old City,“) bars and restaurants all around a walking square. Then on to “Old City,” for our final destination, Barley’s Taproom and Pizzaria . We had planned to arrive just ahead of the 8 p.m. show, but got there at 6, so we enjoyed the outdoor patio, some of the best pizza I’ve ever tasted, and a couple of drinks, until the drizzle chased us inside. Here’s what Barley’s looks like inside. Finally 8 p.m. came, and with it, one of my favorite musicians, Robinella Contreres . Her web site is fun… you can click here and then click on an “ornament” on the tree to hear a sample lyric. I already had one of her CDs, “Solace For the Lonely,” and was thrilled when she played the title song at my request. (You can listen to it here .) I got two more CDs at the show, “no saint no prize” and her first CD, “Robinella and the CC String Band.” If you’ve never heard her, I recommend “Solace For the Lonely,”but they’re all great. Her music has been described as Appalachian church music, straight bluegrass, honky-tonk, jazz, blues and more. On Sunday nights Barley’s isn’t crowded, so we sat fairly near the stage where we could actually see her expressions. So of course I did and off we went to this cool little place called The Knoxville Pearl. It’s a CEREAL BAR! Yes. That’s what they’ve got… rows and rows of cereal. And great retro furniture, like a coffee shop for high school kids or health nuts. Cool atmosphere. s he grabbed a Sharpie and autographed my tee shirt (and one for a friend) and we chatted about our lives. She asked what I did and when I mentioned writing of course she wanted to know about that but when I mentioned art she said what medium and then told me about her art, which you can see some of on her web site. She designs her own CD covers, too. As we walked back to Barley’s, I felt like I had made a new friend. Her voice has star quality, and of course I asked her how much she was touring, making plans for more CDs and all that stuff. “Some folks are pushing me to tour more, and all that, but I really want to spend more time with my family,” she says in her hillbilly accent with her charming, innocent smile. When we got back to Barley’s and she headed to the stage for the second half of her show, I sat back down at our booth with Beth, who’s a good sport about her aging mother’s embarrassing groupie adventures. I think she’s just grateful that I didn’t get up and dance when Robinella started singing again. I wanted to, but I was a bit intimidated by the professional-looking group who danced nonstop in front of the stage all night. I didn’t take photos of them (again, trying to keep my groupie-ish and tourist-esqu activities to a minimum for Beth’s sake) doing some quick-stepping moves … not sure what you’d call it… looked like a combination of the Two-Step, the Quick Step and the Jitterbug! It was really fun living vicariously through them…and much safer for my knees! And solace for the lonely…. >I know I said I wouldn’t be posting again until I got home from visiting my daughter in Knoxville… but she’s working on architecture sketches so I’ve got some time to write and post about my weekend so far. Whenever I’m visiting another city I usually Google independent book stores to see if they have any visiting author events. And even if they don’t, I like to visit these sacred vessels of the printed word(s). I’ll never be a fan of e-books. I don’t even like to read magazine and newspaper articles online, unless that’s the only way they are available to me. So, I read where this store called Carpe Librum (Seize the Book!) –isn’t that a great name for a bookstore?–was inviting local Knoxville authors to meet the public from 1-5 pm on Saturday , and I decided to check it out. I love the sign outside the store. 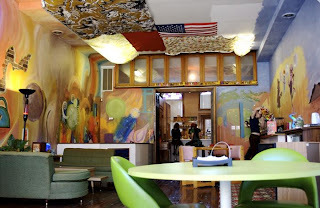 Inside it’s spacious enough to get around in easily, with lots of windows, but cozy enough to invite customers to get cozy in an overstuffed chair or the couch in their social corner, where several authors had gathered already when I arrived. One of the owners, Martha Arnett, was welcoming and helpful, asking about my writing and showing me books she thought would interest me. 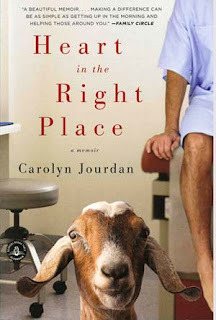 I was especially drawn to a memoir (imagine that) called Heart in the Right Place by Carolyn Jordan. We had a great visit, and as I was leaving, Martha gave me a copy of Voices From the Valley, the 1994 publication of the Knoxville Writers Guild. It contains three poems by another of Carpe Librum’s owners, Florence “Flossie” McNabb. Looks like a great anthology of stories and poems—can’t wait to jump into it. Martha said they’d never had an open house of this kind at Carpe Librum… where they invite new authors to bring their books—some self-published, some not yet published, and others published by small presses—to discuss with visitors to the bookstore. So, I explored every corner of the store, seeking out these fellow writers who were maybe one step ahead of me in this game. The first three I met were offering quite diverse first books: young adult fantasy, science fiction, and a book about barbeque techniques. So I bought one of each and listened to their tales of writing, publishing, and trying to sell their books. I didn’t question them when they each asked me to pay them directly for their books, in cash. It saddened me to learn that some of the fledgling writers were taking advantage of the bookstore’s hospitality. Independent bookstores are the writer’s link to serious readers. I immediately regretted having purchased books “on the side” from these folks who were trying to get around the very system that could be their main support. Sigh. Next I listened to Joe Neil Steward reading from his novel on CD, Just A Tad Too Much Powder. Steward was an actor before deciding to try his hand at writing, and his novels aren’t in print yet, but he has a great voice and seems to have a knack for writing believable-sounding dialect, which isn’t easy. And when I asked to purchase his CDs (for another writing buddy) he immediately directed me to the bookstore register. So, I’m only featuring the “two Joes” on my blog today, and not giving any ink to the writers who sent me to an ATM machine for cash to purchase their books on the side. I know they were struggling and it was tempting, but it always pays to do the right thing. Carpe Librum is a wonderful little bookstore and I felt so welcomed by Martha, who, by the way, when she found out I was from Jackson, Mississippi, immediately asked me if I knew Peggy Hood, and I said yes, she was in my class in high school! Small world, the South. After my outing to Carpe Librum, I returned to my daughter’s apartment. She was still working on a project for one of her grad school classes, while watching UT beat UAB in their first home football game this season, (GO VOLS!) so I went for a swim in the pool near her apartment. What a beautiful view! It’s up on a hill so you can see the tops of the trees as the sun is hitting them. And right in the middle of her apartment complex stands this white Colonial house, which the complex rents out. I’m wondering if the original owners of the land lived in it. 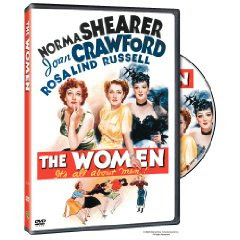 After my swim we went to have a drink and appetizers before heading to a movie I’d noticed ads for: “The Women.” It’s a remake of a 1939 movie starring Joan Crawford. It’s got some of my favorite actresses, included Meg Ryan, Annette Benning, Candace Bergan and Debra Messing. You can see trailers and read about it here. We enjoyed lots of laughs at its humorous moments, but it dealt with serious issues—infidelity, the affect of divorce on children, mothers being distracted by their careers and neglecting their children—while trying to stay on the light side. Not sure how it worked… I left the theater realizing that I had enjoyed it while it was happening, but it left a heaviness hanging in the air, and in my heart. 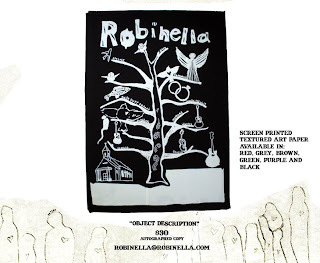 So tonight we’re off to hear Robinella and the CC String Band… I’ve enjoyed Robinella’s CD, “Solace for the Lonely,” for a couple of years and can’t wait to hear her in person. 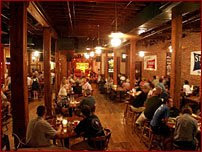 She sings at a place downtown called “Barley’s,” so we’ll head down early to take in some sights in “Old City” Knoxville. Watch for that post on Monday night or Tuesday. Hope you’re having a great weekend! Oh, I forgot to include this detail of some of the local art work at Carpe Librum… the artist is Ana… sorry, forgot her last name, but if you like her stuff, call Martha at Carpe Librum in Knoxville. The last time I got one of these calls I was driving home from a workshop in Oxford, and the weekend nurse was frantic about Mom’s eyes—she had an infection and wouldn’t quit rubbing them and her cheeks were inflamed from Mom’s continual licking of her fingers and then rubbing them on her cheeks to soothe them. Thankfully, that got taken care of. So when I got the message this time, I assumed it was another urgent, but not serious, health issue. Wrong. My heart sank. I knew this day was coming, of course. I knew it when I moved Mom into the facility in February of 2006. But she’s so happy in her current situation, where she is free to roam about the facility at will… the light, cheerful lobby areas, the front patio with rocking chairs, the back courtyard area where her birdfeeder is, the large atrium dining room, and four wings of apartments. Moving “upstairs” would mean that she would be “locked in” to her wing, with only a screen-in porch at the end for exposure to the outdoors. But it would also mean she would get more help in the areas that she’s beginning to need it. So I made an appointment and drove down to meet with the nurse and marketing director on Tuesday. Well, by the time I got there, things had changed a bit. The nurse and I had agreed over the phone that Mom would do better if she moved about the same time as her best friend, Elizabeth, who really needs to move soon. But Elizabeth was protesting and her family was also a bit resistant, so they’re letting her stay downstairs for a while. Probably a few more months. This gave me time to adjust to the idea myself, and to hear about the benefits Mom would receive upstairs, which will really be good for her at this stage of Alzheimer’s. When I finished meeting with the nurse, I went down to Mom’s apartment for a visit. When I asked how she’s doing she said her back had been hurting… really her hip, where she’s had bursitis for a long time. “Let’s stop by the physical therapy room after lunch and see if they can do something to help you,” I suggested. As we sat in her living room area, looking out at the courtyard and her bird feeder, I noticed a bunch of chairs huddled together on the back patio. So, I went to lunch with Mom and as we entered the dining room area I was surprised by how pretty the new chairs were. About then Elizabeth greeted us, and Jamie, another table-mate. “You would,” Elizabeth chimed in. Jamie winked at me. She’s the one with the most brain cells still working. “They’s so unhappy. Our other chairs were so pretty and happy,” Mom repeated. Our food came, tasty pork tenderloin, turnip greens, rice and gravy, cornbread, fruit and cake. Mom picked at her food as she always does, but eventually ate about a fourth of it. She only weighs about 125 pounds. But she’s always loved turnip greens. Trying to distract her from the chair issue, I offered to get us some coffee. “It’s only a few feet further away now.” It was Jamie, the voice of reason, again. “And besides, we need the exercise.” Another wink. I got our coffee and we finished our cake and finally it was time to say goodbye to the dining room and the unhappy chairs. On the way back to Mom’s apartment, Mom complained about her back hurting agiain, so we stopped by the physical therapy room so I could meet the new full time therapist and encourage him to work with Mom. Her lower back and hip were really hurting. Nothing new—her bursitis just kicks up from time to time. We met the new staff, including Grant, a handsome thirty-something guy with an old-fashioned movie-star quality to fit his name. “He’s cute!” Mom noticed immediately. We looked around the room at some of the other residents they were working with. No one was screaming in pain. Some were even smiling, so I hope Mom will cooperate with them when I’m gone. Back in the hall near Mom’s apartment, we found her friend Elizabeth, sitting on a bench, distraught. “What’s wrong?” I asked as we approached. “We won’t let them take you,” Mom sat down beside Elizabeth on the bench and put her arm around her. I looked for an opportunity to plant some positive seeds. Mom actually nodded and seemed to accept the idea. I hope Elizabeth will warm up to it in coming months. They will both get a higher level of personal care up there. I only hope they have happy chairs. 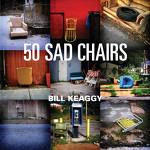 Oh, and by the away, while looking for pictures on the internet of “unhappy” chairs, I found a book called 50 Sad Chairs. Now that’s an unhappy chair. Maybe I’ll eventually learn not to argue with my mother. P.S. I’m off to Knoxville to spend the weekend with my daughter, so I probably won’t post again until Monday. Sunday night I hope to hear a favorite musical artist who lives in Knoxville… so stay tuned for a post about her! >I met some hot mamas Monday afternoon at Off Square Books in Oxford, Mississippi. Well, I already knew Mamacita, whose name means “hot mama.” And yesterday when my friend Sue and I arrived early to get a good seat for Haven Kimmel’s reading, there she was, sitting on the front row with her usual cattitude. So we sat on the second row. Actually, the third. before heading down to Off Square Books for the reading. If you’ve never been to Oxford and this sounds confusing, it’s really not. See, the main bookstore doesn’t have enough space for readings, so the readings are just down the black at their “annex”… which also carries lots of titles, magazines and other cool stuff. Haven welcomed me like a long-lost friend, although we’d only met online, when she did the interview for my blog. She also recommended a couple of literary agents for me to query. I’m always blown away by the generosity and support so many successful authors pour out to us fledlings. Thanks, Haven! Okay, maybe you have to read the book to get this. Someone asked her about how much research she did for the book, which has lots of great details about Jung, Freud, archetypal psychology and literature, alien abductions, and other mythical and mystical stuff. Her answer was humbling. She read everything she could about everyday life in the year 1987. And about 3000 pages of source materials on Freud, Jung, Hillman, and others on dreams, the underworld, all that stuff. She was already familiar with lots of this, but feels it’s really important to get the details right. Once she read everything she could find by Kierkegaard just to be sure she wasn’t using the one quote by him out of context for her book, The Used World. I was impressed with her humility when she said, “Imagine how difficult it is to write a genius when you’re not one!” I personally think Haven is brilliant, but the point is, she does her homework. Jerry and I were leaving a theatre where we had just watched Gone With the Wind. “Do you regret that the feminine way women dressed in those times has vanished?” I asked. 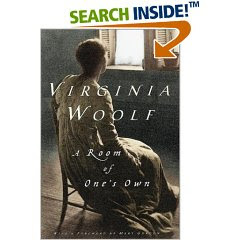 …as I looked around at the other moviegoers in the parking lot, I saw what he saw: The women were dressed in silk chiffon and gauzy cotton dresses, some of them strapless, a couple with full skirts; all looked soft…. Southern women are expected to be pretty and tasteful; they always have been. They still love beautiful fragrances and cosmetics. They still get dressed up for church on Sundays, even as church dress has become more casual elsewhere. Karam-Read’s book is delightful… and a whole lot easier research than Kierkegaard! The second book I found before leaving Off Square Books was Trappings: Stories of Women, Power and Clothing by Two Girls Working: Tiffany Ludwig and Renee Piechocki. 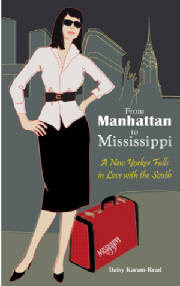 That’s Oxford, Mississippi’s own Clara Lee Arnold on the cover. And this photo from inside the book (right) is in front of Neilson’s Department Store on the Square. When I was a student at Ole Miss in the late 60s, I couldn’t afford to buy clothes at Neilson’s. Years later, on one of my first return trips to Oxford, I made a bee-line for their shoe department. But that’s for another chapter. Now this is a great find, because these gals have already done the research. Over a period of six years, artists Tiffany Ludwig and Renee Piechocki interviewed over 500 women from across the United States asking them to respond to the question: what do you wear that makes you feel powerful? You can read about the project here. I was dating a man in Columbia, Missouri, for a while, and I would go up there and I was like, Oh man, I look good. There is just an attitude in Oxford to be looking great all the time. I’d go to the grocery store in Missouri and I’d have on makeup. And people would be looking like, Why are you so dressed up for the grocery store? That’s what I grew up with in Jackson, Mississippi. 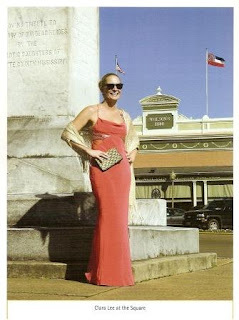 And that’s what Daisy Karam-Read found out about Gulfport, Mississippi when she moved there from New York City. And of course it’s not that New York City isn’t stylish. Remember her husband’s comment when they came out of the movie theater? About how beautiful all the southern women looked? Her response? In my omnipresent black top, classic black trousers, black ballet flats, and red lipstick, I was chic, of course, but I didn’t look southern. Some things can’t be taught. And other things are hard to unlearn. So I’m back home now, looking at comments from my critique buddies on Chapter 6 of my memoir and remembering that my readers will be trusting me to know a whole lot more about my subject than I tell them. And yes, Scott and Haven, research helps. But nothing is more valuable to the authenticity of this book than the decades I spent in Mississippi (and even in Memphis) … trying to be that Pretty Woman… and dressing the part for love.